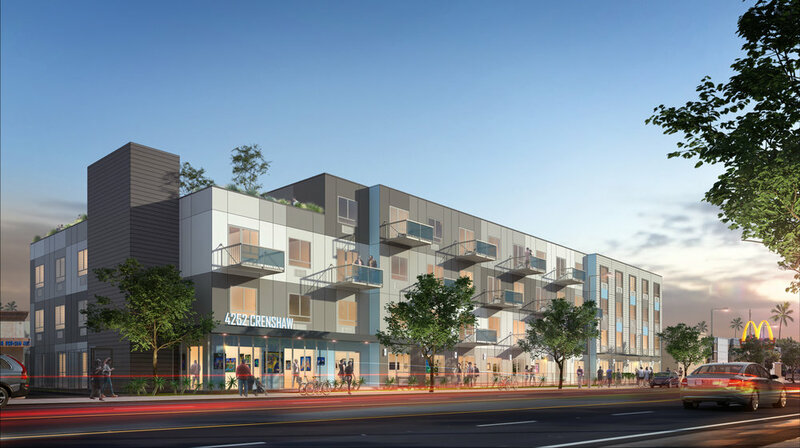 4252 Crenshaw is located along the rapidly evolving Crenshaw Corridor in close proximity to the historic commercial core of Leimert Park Village. The pre-fabricated modular construction method significantly reduces the duration of the construction phase and construction waste. Additional benefits of the pre-fab method include: reducing construction cost and financing time, diminishing construction nuisance to adjacent neighbors, and bringing housing to market more quickly. The modular apartment units are delivered with interiors fully finished with cabinetry, appliances and fixtures installed. 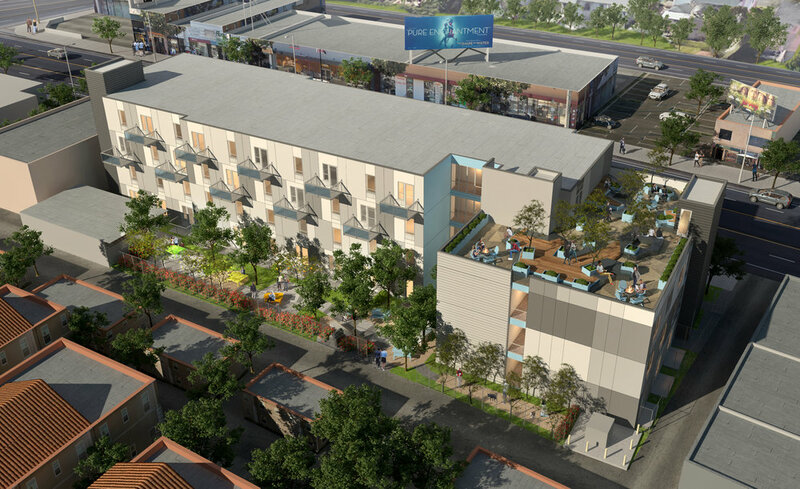 The project is designed under the City of Los Angeles’ Transit Oriented Communities (TOC) program, intended to incentivize the production of affordable housing near public transit. The 111 unit project, which offers no on-site parking as allowed by the TOC guidelines, provides workforce and affordable units targeted to specific markets: the workforce units target young professionals in the beginning stages of their working lives, while the affordable units target very low income residents who qualify. The challenge of the project was to respond to the context of the existing and proposed development projects along the Crenshaw Corridor, while honoring the adjacent residential neighborhood, comprised primarily of Spanish Revival apartment complexes and single-family homes. 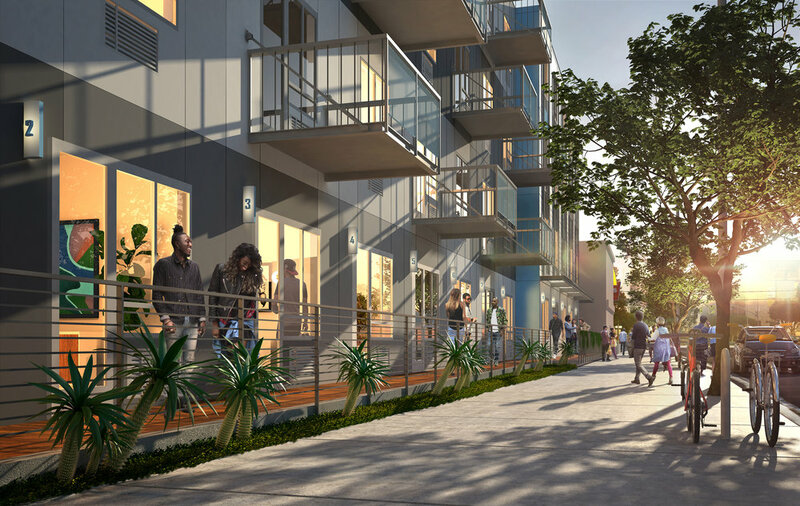 The project program responds to both conditions by locating live-work units and interior common areas, such as building entry, lobby and business center, along the commercial and retail-oriented Crenshaw Blvd., while locating residential-scale amenities adjacent to the residential neighborhood. A ground-level backyard garden, which buffers the building from the adjacent neighborhood, includes ample outdoor tables, BBQ’s, and secure bicycle storage area. The roof deck, offering views to downtown Los Angeles, is designed to accommodate quiet gatherings of small groups.